It has been requested that this article be rewritten. Reason: Poorly organized sections. The Wall Jump (also known as the Wall Kick) is a move that several characters can use in various games. The move is activated by jumping at a wall and hitting the jump button again upon colliding with the wall. If done in narrow passages, characters can jump between the walls to ascend to a higher platform or over an obstacle. Mario performing a Wall Jump in Super Mario 64. Mario performing a Wall Jump in Super Mario 3D Land. In many early games, before the implementation of the actual wall jumping mechanic, maneuvers similar to the wall jump exist as glitches. For example, in Super Mario Bros., if Mario lands on a wall on a 16×16 boundary (so that his foot is on the top corner of a block), the player is able to jump from that point if they have frame-accurate timing. Similar glitches also exist in Super Mario Bros. 3, Super Mario World, and Super Mario World 2: Yoshi's Island. The Wall Jump itself was first implemented in Super Mario 64. Here, if Mario jumps at a wall, he will bounce off; but if the player presses as soon as Mario hits the wall, he will kick off the wall, jumping higher. The angle of the Wall Jump can also be adjusted, based on the angle Mario jumps at the wall. In games starting from Super Mario Sunshine onward, characters will slide down the wall, making Wall Jumping easier and the timing of the jump adjustable. This characteristic carries over to the remake of Super Mario 64, Super Mario 64 DS, as well, and Mario is the only character that can Wall Jump. Starting from New Super Mario Bros. onwards, Luigi can Wall Jump as well. Also, in Super Mario Galaxy 2, the Mailtoad mentions that Captain Toad has the ability to Wall Jump as he was able to scale a canyon in pursuit of The Chimp in the Fluffy Bluff Galaxy; however, Captain Toad is unable to jump at all in Super Mario 3D World and Captain Toad: Treasure Tracker, likely due to his heavy backpack. Toad, Princess Peach, and Rosalina can also Wall Jump in Super Mario 3D World. Mario performing a Wall Jump in Super Mario Run. In the New Super Mario Bros. series, Mario, Luigi, Yellow Toad, and Blue Toad are capable of Wall Jumping. In New Super Luigi U, Nabbit is also capable of Wall Jumping. In New Super Mario Bros. U and New Super Luigi U, the player can perform a Spin Jump while Wall Jumping. 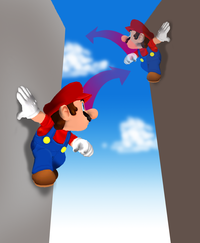 In Super Mario Run, characters can Wall Jump off of the sides of most walls and platforms by tapping the screen when they are holding on to a wall. In Toad Rally, performing consecutive Wall Jumps attracts more Toads. Starting in Super Smash Bros. Melee, several characters can wall jump in the Super Smash Bros. series, which works by tilting the control stick in the direction away from the wall when against a wall. Since Super Smash Bros. Brawl, some of these characters are able to wall cling as well, which allows them to indefinitely stick to a wall as long as they hold the control stick in the direction facing the wall. Only six characters are able to wall cling, those being Lucario, Diddy Kong, Squirtle, Greninja, Sheik, and Bayonetta. The move makes an appearance in Donkey Kong Jungle Beat, where Donkey Kong is able to use it. While it operates similarly to its use in other games, the player must be constantly tapping the control stick or hitting the bongo in the direction of the wall to be able to slide down the wall. In Mario Superstar Baseball, this move is used as a special fielding ability. Mario, Luigi, Bowser Jr., Baby Mario, Baby Luigi, and Toadette can use the move in this game. When a character jumps near a wall, they take a great leap off of it, covering distance at a vertical angle. The move is used to catch low home run balls. In Mario Super Sluggers, this special ability is absent, possibly replaced by the Buddy Jump move. In Mario vs. Donkey Kong 2: March of the Minis, Mini Marios can Wall Jump on Wall Jump Bars. In Mini Mario & Friends: amiibo Challenge, the Wall Jump is Mini Mario's special ability, which is triggered whenever he encounters a wall or another vertical surface as he walks on horizontal ground—however, he does not stick to the wall if he walks up a slant or bounces from a Spring onto it. Upon sticking to one such surface, Mini Mario will automatically bound from one surface to another until he reaches a platform. This ability is essential in reaching Mini Mario's assigned door in Level 5, located at the top of the stage. After clearing the level through said door, Mini Mario gains access to the Boost Pad Bonanza set of levels, where he makes extensive use of the Wall Jump ability. In Mario Tennis Aces, Mario uses this technique as part of his Special Shot, which is called the Blazing Wall Jump. Although Luigi was able to wall jump in the E3 demo of Super Smash Bros. for Nintendo 3DS, he cannot in the final game for unknown reasons. This page was last edited on March 22, 2019, at 20:41.